At the age of 8, piano was Michael’s first instrument. The egg timer was set by his mother for 30 minutes every day atop the small spinet piano in the living room. Regardless of other goings on tugging at Michael’s interests, piano practicing always came first. At age ten, Michael discovered the trombone. No longer did practicing need to be mandated. Playing trombone would become his favorite activity fueling a passion that would last a lifetime. Michael attended Arizona State University where he studied with renowned jazz educator Dan Haerle. It was at ASU where he first saw an alto trombone, the odd instrument he would play for the rest of his career. 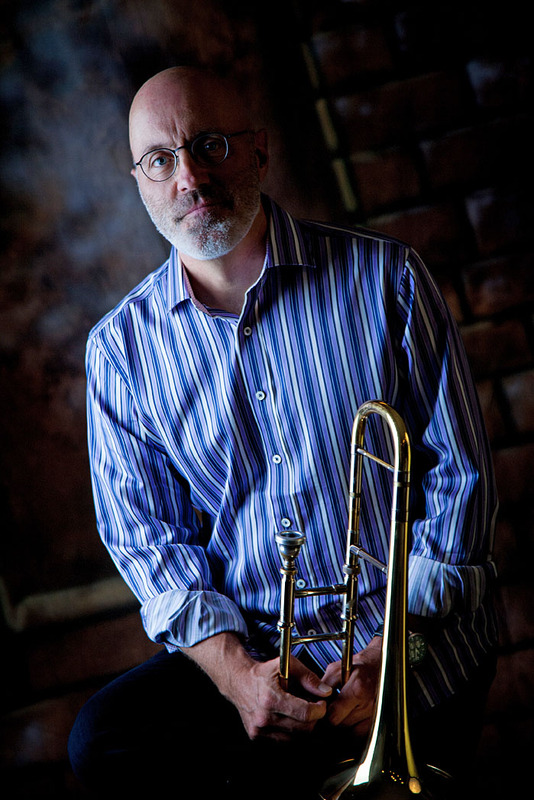 His trombone teacher at ASU, a graduate assistant named Kevin Hedges owned an alto and first introduced it to Michael. Professionally active and pursuing a jazz performance degree, abandoning the tenor trombone in favor of this beautiful instrument of clarity and efficiency was not a practical move. Nonetheless, Michael was determined to make it his musical voice. From that point, it would become the instrument he would play professionally and exclusively. Mid-way through his ASU education, Michael was awarded a National Endowment of the arts grant to study for a summer with Frank Rosolino. In November prior to the summer of study with Frank, Michael learned of Frank’s tragic death. Looking for an alternative that would be acceptable to the National Endowment board, Michael reached out to avant garde trombonist George Lewis. George, he learned, would be teaching that summer at the Creative Music Studio in Woodstock NY, and welcomed the opportunity to work with Michael. He was exposed that fascinating summer not only to George Lewis, but would also study with Anthony Braxton, Roscoe Mitchell, and other members of the Art Ensemble of Chicago. After ASU, as Michael traveled and performed throughout the country, he settled for a while in Boston where he joined a four-trombone salsa band called Caribbean Express. A year after joining the band they signed with A&M Records and upon the release of their debut album were nominated for a Best Latin album Grammy. Next, Michael moved to New York City where he played professionally for 10 years. Michael performed in a variety of settings playing mainly jazz and latin music with notables like Lalo Rodriguez, Frankie Ruiz and for several years was Ray Barretto’s trombone player. Michael eventually moved back to his beloved Phoenix Arizona where he regularly performs throughout the valley. Having spent the past 20 years collecting state-of-the-art and vintage audio gear, Michael has rebuilt his impressive recording and performance studio where he recorded his latest album, “Roads Less Traveled”. Michael Lives with his two young sons and enjoys hiking and biking in the nearby mountains of Cave Creek. Lake keeps his trombone as the focal voice on the recording, with the synths adding decorative frills and embellishments. He has studied with George Lewis, Anthony Braxton, Roscoe Mitchell, and other members from the Art Ensemble of Chicago. His experience as a live performer exposed him to a variety of settings playing mainly jazz and Latin music with notables like Lalo Rodriguez and Frankie Ruiz. For several years, he was Ray Barretto’s trombonist. Lake’s balance between artificial ringlets and acoustic waves make for an intriguing jaunt.